The New Jersey “Shoot-Out” — That Never Happened?? In their book on pages 146-148 John Alite and George Anastasia tell a fascinating, cinematic story of “a shoot-out” that took place on Alite’s property in New Jersey in 1990. However: John Alite gave wildly varying accounts of this “shoot-out” in his FBI-302s from 2009, an interview he gave for a documentary in 2014 and another on the radio in 2015 where I called in and asked him about it. Alite did not bring this “shoot-out” up in his February, 2009 testimony in the Charles Carneglia trial which he would have had to when the prosecutor asked him about the people he killed. The FBI-302 below memorializing Alite’s account of the incident is dated 8/17/2009, less than a month before Gotti’s trial began in September, 2009 while Alite started debriefing, officially (he has been a cooperator since at least 1991) all the way back in 2007 which makes it strange that the shoot-out was not recorded in an earlier 302 as two years is a long time for a prosecutor or FBI agent to not record you telling them that you killed someone. For that and other reasons below Alite most likely made up the story to make himself seem like a big-shot in his coming testimony against Gotti, to act like he was more in the know than he ever was, to give himself more credibility so the jury would hopefully believe him so he could win a conviction and get out of prison quicker, and, to help nail a lucrative book and movie deal later on. In typical John Alite fashion, however, he was not able to stick to his story and made up the details as he went along. The evidence is presented in chronological order. NOTE: Tommy Pitera was arrested on June 3rd, 1990 for multiple murders, was convicted at trial on June 25, 1992 for six murders and was subsequently given a life sentence so most likely John Alite would not have been contemplating killing Pitera in 1991 or 1992 as he was already incarcerated and facing the death penalty. Something as significant as“I killed him. I shot him, I had him on the floor and I, I finished him” would have been one of the first things Alite told the Feds during his debriefings. That kind of admission would have made it into one of his very first recorded 302s in 2007, not ending up in one weeks before Gotti’s trial in 2009 that only said: the source thought he shot two of the four intruders, possibly injuring them seriously. Alite was positive he shot at least two of the men before they ran off his property. The following morning Alite looked around the shooting scene and didn’t find any bodies but instead lots of blood. Alite was sure the shooters were sent by Tommy Pitera because he heard them speaking Spanish and Pitera dealt with drug dealers from Mexico. Several days after the “shoot-out” Alite was proven right when he was sent for by John Gotti Sr. and ordered to see him at the Ravenite Social Club for a meeting with Tommy Pitera. Alite said it was Pitera who asked for the meeting. John Gotti Sr. squashed the beef between them and said that whatever happened was in the past and it was over. He forced them to agree. Outside the club, walking to their cars, Alite still threatened Pitera. He said nothing had changed and he was still going to kill Pitera. Pitera was arrested before Alite could kill him. Not only did Alite and Anastasia make no mention in their book about Alite “finishing” anyone, their story of Alite and alleged Bonanno soldier Tommy Pitera sitting down with John Gotti Sr., the boss of bosses at the Ravenite Social Club after the shoot-out is directly at odds with Alite’s 302 that ends with: The source never heard anything more about this incident. Not to mention: Alite and Pitera walking and talking outside the club would have shown up on the 24-7 video surveillance the Ravenite was under which would have been presented during his testimony to heighten his credibility and corroborate his stories– just like it was done when former Gambino underboss Sammy Gravano testified in numerous trials– and a photo of Alite and Pitera together most likely would have ended up in his book because after all, it’s not like there are pictures in it of Alite with any other mafia big-shots from that time (outside of John A. Gotti). 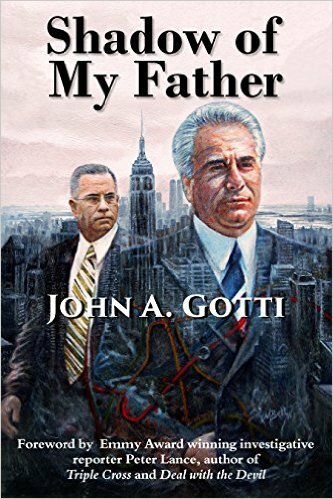 There are pictures in it of John Gotti Sr., just none of Alite with John Gotti Sr. which there would have been if they were actually friends like Alite says. A statement that is at odds not just with his 302 but also his book and documentary. More important than that inconsistency however is his admission that the subjects of FBI interviews are not in control of what the agents/prosecutors write in their reports which contradicts everything Alite says about being certain of what other people said in their meetings with agents/prosecutors. In effect, he is admitting that the whole process is corrupt and FBI agents/prosecutors can include/leave out whatever they want or even make up things that their interviewees never said. In the end, though, when discussing this alleged incident with John A. Gotti and Alite’s discrepancies in his recounting it not only did Gotti not believe it to be true either, agreeing that Alite made the story up prior to his trial to seem like a more important witness and to help land a book and movie deal later on, he even laughed at Alite’s audaciousness. “He said that! ?” John A. Gotti marveled as I played the video for him of Alite describing how he “finished” someone. But it goes beyond Alite just appearing on video with Tommy Pitera outside the Ravenite. Federal informant Frank Lino who the government alleged was Tommy Pitera’s captain in the Bonanno family in 1990. Former Bonanno underboss turned cooperator Salvatore Vitale who according to numerous sources was part of the Bonanno administration during 1990 when their boss was in prison, so, he most likely would have been at any sit-down between the Bonanno family and the Gambinos that was at the boss level especially since multiple sources including former Bonanno boss turned cooperator Joseph Massino confirmed that Vitale had a relationship with John Gotti. Former Gambino underboss turned cooperator Sammy Gravano, who, when he flipped in 1991 still would have had this story about Tommy Pitera sending a Mexican hit team to kill Gambino associate John Alite fresh in his mind and would have told the FBI about it. In fact, he probably would have testified about it at Tommy Pitera’s 1992 racketeering-murder trial because it most likely would have been added to Pitera’s list of charges. Before this information made it to Gambino boss John Gotti or the street boss of the Bonanno family who would have been at the sit down with him it would have went through these three individuals, their subordinates, but, not only did none of them make any mention about this incident in their FBI-302 debriefings or in their trial testimonies, there is not even a mention that any of them knew John Alite in their FBI debriefings and trial testimonies even though Alite has said in interviews that he had multiple “business talks” with Sammy Gravano specifically. In Fact, Sammy Gravano did not even include John Alite on the full list of people he believed to be members and associates of the Gambino family that he provided to the FBI after he cooperated. Not just of the shoot-out and sit-down though, but also of the bodies. If this shoot-out story was true there would have been police reports from 1990 about any bodies being found in New Jersey, people that showed up to the hospital with bullet wounds or missing persons reports that were filed, etc. 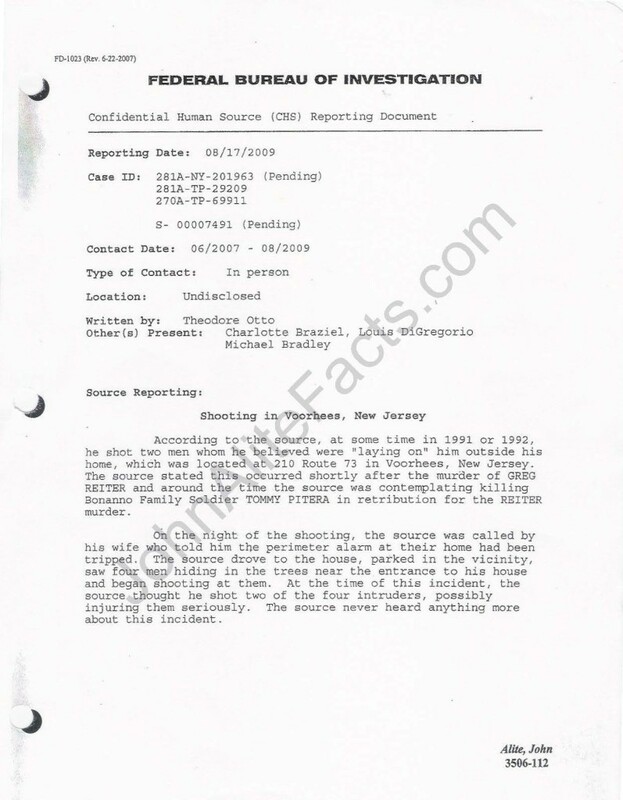 The minute John Alite told the FBI about finishing someone they would have dug up the body themselves, if Alite had told them he buried it– you know he never did say what happened to the body of the guy he “finished”… and, they would have contacted the cops in Voorhees, New Jersey where his house was and would have requested any and all records to corroborate his stories. Not just to see if John Alite was telling the truth but to protect their case. Had John A. Gotti been convicted off John Alite’s lies he would have won a new trial and possibly a reversal of conviction if it came out later on that John Alite lied about the number of people he killed. And, these police, hospital and missing persons reports, etc? If they existed they would have been included in the discovery material given to Mr. Gotti and anyone else John Alite was going to testify against prior to their trials so they could cross-examine him. All that was provided was a 302 from August, 2009 saying that John Alite thought he shot two of the four intruders, possibly injuring them seriously (with no mention of him ‘finishing’ anyone). 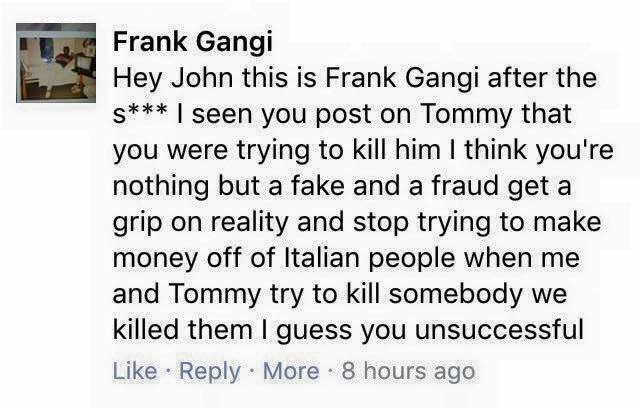 Frank Gangi, who according to reports began cooperating in April, 1990 is welcome to come on this website to defend his friend and rebut any of this at any time by providing documented third-party evidence that Tommy Pitera knew John Alite. 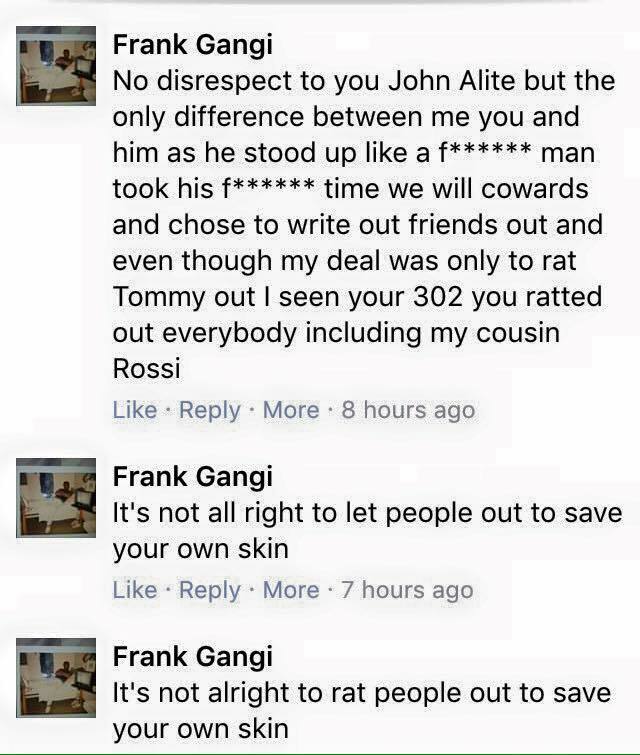 For instance, can Frank Gangi provide any 302s or FBI notes of his 1990 debriefings telling the FBI that Tommy Pitera tried to kill John Alite? That there was some big sit-down over it with the boss of the Gambino family? And, can Frank Gangi point out where he discussed Pitera hiring Mexican hitmen, as Alite alleged, to kill Alite in 1990 in his trial testimony? Because Gangi definitely would have mentioned it when he testified against Pitera in 1992 and described all of Pitera’s alleged murders and mayhem for the jury, and, had Gangi known about the shoot-out the attempted murder of John Alite probably would have been one of the crimes Pitera was arrested for. NOTE: John Alite’s lawyer/agent Douglas Anton also represents Sammy Gravano, and, Anton and Gravano are welcome to reach out to this website at any time and discuss why in Gravano’s FBI debriefings there was no record of a shoot-out/sit-down between John Alite and Tommy Pitera in 1990, or, that Sammy Gravano even knew of a John Alite in 1990. All they have to do is comment below. the source thought he shot two of the four intruders, possibly injuring them seriously. The following morning Alite looked around the shooting scene. He didn’t find any bodies but instead lots of blood. 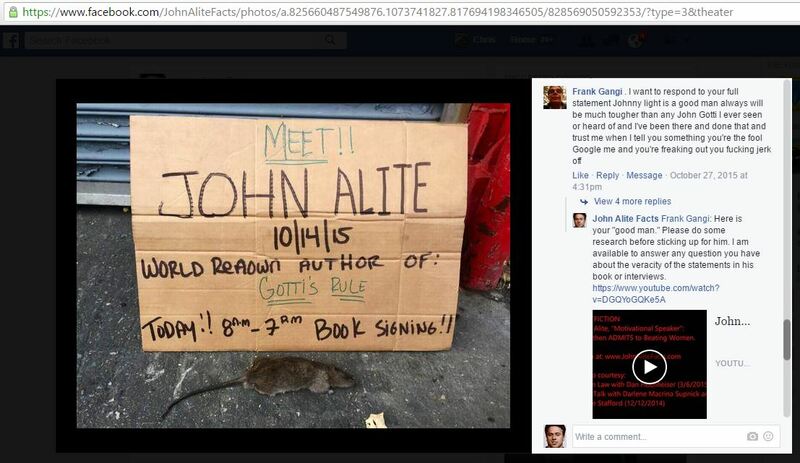 QUESTION: If John Alite is willing lie about killing someone in a book, on the radio and in a documentary broadcast around the world on international television, what else would he lie about? 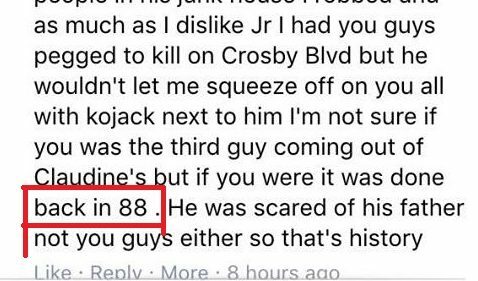 UPDATE – 5/18/2016: In an interview after this post was originally published John Alite’s brother, Jimmy Alite, also denied that this event ever happened. 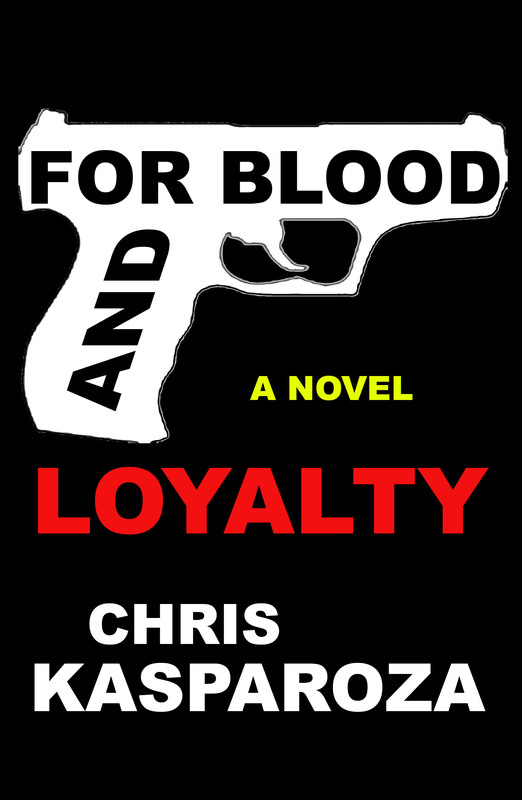 He said that if there was a major shootout on his brother’s property, if a reputed mafia hitman had sent a murder crew for his brother he would have been the first one who would have shown up there to help defend the property with his younger brother John. Jimmy Alite said that he would not have left his side, that he would have died shoulder to shoulder with him if that’s what it came to. However: he never heard a word about this “shoot-out” either. NOTE: These comments were made under a picture of Alite and the director of his upcoming “documentary,” Andy Deliana, that was posted by Deliana… a director who I previously corresponded with and explained to that Alite was a fraud and his whole New Jersey Shootout story, which is being re-enacted in their film… never took place. Mr. Deliana did not seem to care, as he is going forward with their documentary full of lies and is probably scamming their investors by telling them that it’s true, just like Anastasia wrote their book full of lies and probably scammed his publisher by saying it was true. Arat had the skunk in the head lights look when asked about the incident, arat did’nt believe himself, stevie wonder could see that. This morning this said 50 people had shared it on facebook and now it say’s 315 That’s great!! Keep up the great work!